OK, so where are HP’s and Dell’s WAPA announcements? It appears to me that this is the “first official production release of the Windows Azure platform appliance by” anyone. Question: Was the timing of the Microsoft/Fujitsu press release influenced by Paul Maritz’ interview by IDG Enterprise Chief Content Officer John Gallant and Eric Knorr, “when he talked about the 1,000 or so public cloud service providers that are running the VMware stack”? In most cases, a public cloud service will charge more to host your infrastructure long term than it would cost you to purchase and maintain that infrastructure yourself. By the same token, though, you don't want to buy and babysit infrastructure you need only part of the time. That's one of the main ideas behind the hybrid cloud: Build and operate a private cloud in your own data center and burst to a service that charges by the hour when you need it. Within that community, what we've elected to do is to try and pick a very small subset of [providers] who are committed to have the same suite in their public clouds. So in particular that user interface is going to be common between the two. The way that you describe and secure and manage your workloads will look the same internally versus externally. What is Windows Azure platform appliance? Windows Azure platform appliance consists of Windows Azure, SQL Azure and a Microsoft-specified configuration of network, storage and server hardware. It is a turnkey cloud platform you can deploy in your datacenter. Service providers, governments and large enterprises who would, for example, invest in a 1000 servers at a time, will be able to deploy the Windows Azure platform on their own hardware in their datacenter. Microsoft Windows Azure platform appliance is optimized for scale out applications – such as eBay– and datacenter efficiency across hundreds to thousands to tens-of-thousands servers . What are the benefits of the appliance? The main benefit of the appliance is that it provides the benefits of the Windows Azure platform with greater physical control, geographic proximity, regulatory compliance and data sovereignty. Does the appliance include hardware, what kind? The appliance will run only on network, storage and server hardware that meets the Windows Azure platform reference specifications. Microsoft has invested significant engineering resources to ensure that the hardware required by the appliance is optimized to enable service availability, automated management and power, cooling and operational efficiency across tens of thousands of servers. This hardware is based on industry-standard x64 hardware in order for customers to be able to purchase the appliance from a choice of partners. When will Microsoft Windows Azure platform appliance ship? Today we announced the Limited Production Release of the Windows Azure platform appliance to a small set of customers and partners. We will develop our roadmap depending on what we learn from this set of customers and partners. We have no additional details at this time. What is the difference between Windows Azure platform running in Microsoft’s datacenter and Windows Azure platform appliance? Microsoft offers the Windows Azure platform as a fully managed service in Microsoft’s datacenter. Microsoft manages the entire platform including hardware and day-to-day operations. The appliance allows customers and partners to deploy the Windows Azure platform in their own datacenter which some customers and partners have requested because of their need to for physical control, data sovereignty and regulatory compliance as well as geographic proximity. Microsoft will, however, continue to provide updates to the Windows Azure platform service running on the appliance, just as we currently manage updates to more than 750 million individual PCs worldwide running Windows update. How is Microsoft Windows Azure platform appliance different from running a datacenter with Windows Server, Hyper-V and System Center? 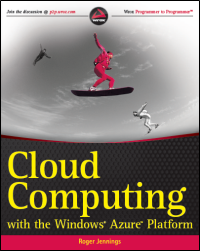 The Microsoft Windows Azure platform appliance allows customers and partners to deploy Windows Azure and SQL Azure in their own datacenters.. The appliance is a turnkey cloud platform that runs on hundreds to thousands of servers optimized to deliver hosting services and massive scale-out applications, PaaS, SaaS, IaaS or high performance computing. Windows Server, Hyper-V and System Center is a versatile, customizable server platform that allows customers and partners to build and run a dynamic, virtualized infrastructure and private clouds. Why call it an appliance? Isn’t it bigger? You can think of it as an appliance because it is a turn-key cloud solution on highly standardized, preconfigured hardware. Think of it as hundreds of servers in pre-configured racks of networking, storage, and server hardware. We intentionally are using the term appliance to convey that the Microsoft Windows Azure platform appliance consists of highly-specified networking, storage, and server hardware that is pre-configured. The Windows Azure platform appliance is similar to typical server appliances in that it is designed to be easy-to-use, the hardware will be locked down, and the platform software is typically updated by the vendor. When will the appliance be available? We are still evaluating timeline, partner and customer requirements. Please return to this site for further updates.